The fabulous team of Fat Quarter Shop and It’s Sew Emma have done it again with their free mini quilt pattern – Nail Polish. Make sure you check out the accompanying video at the Fat Quarter Shop Youtube channel. I made mine into a quilted pillow/cushion cover. I just need to find an insert. This is a great project to use up your solids (or in my case, some textured solids). 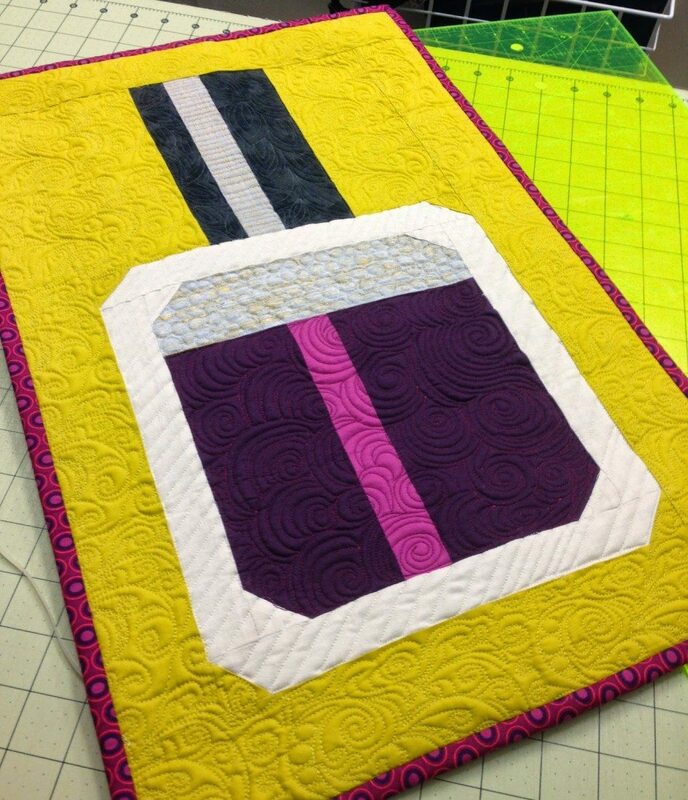 The finished mini quilt is 14 1/2″ x 22 1/2″. Using my Art Gallery Pure Elements, Laura Gunn Painters Canvas and Metallic Tussah from Robert Kaufman I made the nail polish in a plumb shade. I used Oval Elements for the backing and binding. Using Aurifil 5015 40wt, 2600 50wt, 2024 50wt, 4030 50wt and 2630 50wt cotton thread I used a combination of freehand and digital quilting to give body to the cushion/pillow cover. The back is also quilted in 4030 50wt cotton. The Fat Quarter Shop have kindly given me a $50 gift voucher to give to one lucky reader. Think of all the beautiful solids you could purchase with $50. To be in the draw for the gift voucher, just leave me a comment on this post telling me your favourite shade of nail polish. The competition will be closed Wednesday 13th August midnight AEST. My favourite nail polish shade is navy blue! Hot pink. Every time. Great giveaway! Gorgeous quilting Jane, and I love the pop the metallics give! I'm rather partial to Tiffany Blue on my toes at the moment. Unfortunately fingers never seem to last very long for me so I rarely paint them. Maybe one day when I have a housekeeper, gardener, chef, nanny…. Beautiful quilting, as always. My favourite shade at the moment is coral. Love the mini! My favourite shade of nail polish is a Loreal Coral! I love everything coral, but my toes are permanently coral during spring/summer! Love your mini quilt. It's gorgeous! My favorite shade is pearl. My favorite shade is coral now. Your Nail Polish MIni is the cutest! Love your cushion cover!! I don't paint my nails mainly because the polish wouldn't last while I work!! But! I admire the women who can wear nail polish and bright red is my favorite!! Thanks for the chance to win such a generous giveaway!!! Unfortunately my nails are not nice enough to paint but I love all the bright colours available and could make a mini in sew many different colours. What a great teen gift! Gorgeous! My favourite is a bright pink that I bought for my girls! Revlon's Cherries in the Snow – a gorgeous crimson/red – LOVE it! Hot pink at the moment! I love love Lilac! Love your mini quilt! your quilting always amazes me. My favourite nail polish colour is a deep dark red, or sparkly purple! I only put polish on my toe nails. I like aqua or lime green for that. The only nail polish color I use is Clear – thanks for the great giveaway. Your mini quilt is cute! I don't wear nail polish, but if I did, then a nice, bright red would be my choice. Adorable mini quilt. I prefer a clear polish or sometimes a pearl color. It would have to be pink……….. Cute quilt! Love a nice shade of berry pink polish. Thanks for the fab giveaway! My favorite is Sheer French color. I don't wear nail polish but if I did it would have to be a dark colour! Darling, darling quilt! I don't polish often, but when I do, I want bold! Thanks for this great giveaway! I love to put red on my toes and pink on my finger nails. Thanks for the lovely giveaway. I love your nail polish, girl!!! My favorite is shocking pink, though I NEVER wear it, as it makes me very conscious! I go with black instead! Opi's I'm not really a waitress. What a fun pattern! Ny favorite polish color for my toes is OPI Senorita Rose-alita. Cute, cute quilt. Wonderful give away!!!! My current favorite is Fiesta because that is on my toes at this time. Thanks for a chance. I have to go with purple even though I don't wear polish that often. I don't wear nail polish, but if i did I think it would be red or pink:) Thanks for a chance at a great prize!! I love ALL nail polish colors, but right now I'm really liking mint greens. :). y go-to color is a beige-gray. I'm not adventurous with nail polish. I wear a light pink with sparkles, it goes with everything. I look at the blues, greens, red and lust but I chicken out. Love your mini. Thanks. silver is my absolute fave! I never use just one color of nail polish at a time. I have two combos that are my favorite, at least right now they are my favorite, OPI Rainbow Connection (rainbow glitter) over OPI Black Onyx, and OPI Kiss Me on my Tulips with OPI Gone Gonzo (teal glitter) on top. Great Mini!! I love silver glitter polish!! Thanks for the chance to win! My favourite for years has been "I'm Not Really a Waitress" red from OPI. They have the best names/puns. I love the yellow in your background btw. I love OPI polish and they have such great names to their colors – my current fave is one called "I'm feeling sassy"
I love shiny dark pink. Teal. It's the one bottle of nail polish I actually own! 😉 Thanks for the chance to win! I am currently wearing the Thrill of Brazil by OPI on my toenails – it's a really bright red. Can't keep polish on my fingers for some reason, as a nurse I just wash my hands too much and do too many things that make it chip. Thanks for the awesome give away! my fav has always been a coral orange! My favorite shade of nail polish is always pale pink. I just love it! My favorite is a light pink. Funny, I don't wear colored nail polish just clear. I just love the way it shines! It changes all the time…once it was ladybugs (black and red), then a wine color, then a raisin, then pink…now french tips with clear! ha ha… my one other vice (first is fabric!) Thanks for the giveaway chance! Adorable quilt! My favorite nail polish color is pink and black. It changes all the time! One of my old faithfuls though is a pale pink by OPI. I don't wear nail polish. My nails keep breaking off. I do a French manicure with clear polish on top. 🙂 Thanks. I like the idea of the cushion/pillow cover – Cute!! I wear hot pink on my toes – Makes me think I'm younger! :0) Thanks for this opportunity to win!!! My favorite nail color is Cranberry Red (toes only!). Tthanks for the chance to win. My favorite shade of nail polish is Blazing Sunset. If I do my nails, it is usually a very neutral shade. My favorite is called "Drama Queen". I swear it really does not fit me. I am not a drama queen – do you hear me – I am not a drama queen! My favourite shade is an opalescent pearl. I just downloaded this pattern a few hours ago! I think it's replaced what I was going to do at this week's Sew-cial. I like wild colors occasionally but I always come back to a coral shade. More pink than orange. Thanks for the chance to win. I am making this little quilt this afternoon! I currently like lime green! But my favorite changes quite frequently. My favorite polish is light pink, shiny, but barely there. my favorite shade of nail polish is Copper, it goes with everything. I don't wear polish often, but when I do it has to be pink. Any shade will do, so long as it is pink! Thanks for the chance to win! I definitely like colors in the deep reds/magentas! What a cute quilt! I like cherry red polish. My four-year-old granddaughter loves having her fingers and toes painted, so that is a ritual of ours every time that she visits. Thanks for the great chance to win, and thanks for your inspiring blog. I love the bed runner with the pocket. I'm going to make one for my granddaughter. I just adore magenta nails. I just love this little quilt! I now have gifts (once made) for 3 special ladies in my life!! My favorite shade of polish is deep rose. I am completely in love with bright summer shades like hot pink, orange, and aqua! HI, love all shades of pink! My favorite shade of nail polish is Dutch Tulips by OPI. I only paint my toe nails–today they are turquoise! My favorite nail polish color is Petal Pusher by ULTA. It's a blend of pink and coral. The prettiest nail polish I have had is a gold OPI one. My favorite polish is purple – light in the summer and dark in the winter. I love dark navy blue, although I don't wear nail polish that often. I also like golden yellow. Your background color is awesome!! I guess I'm boring, but I love the taupes and beiges and nudes. My favorite is red! Thanks for the giveaway. Neat quilt with great colors. Clear polish for me. I love a good classic red like NYC Color Times Square. I like a soft pink polish. Thanks for a great giveaway opportunity! I almost always go for a classic red! It is adorable. Honestly I don't wear nail polish but DD is starting to and she automatically pinks the Hot Pink shades every time. Thanks for the chance to win. I love the deep pink colors, oops! That reminds me, time for a pedicure! Wow, gorgeous.I love change,My favorite nail polish is deep rich color.Today my nails are orange! This summer I have been wearing metallic polish in gold and lavender. I only do my toes, so it makes them shiny, but light. Doing the mini quilt as a cushion cover is great. How about buying an inexpensive bed pillow and sewing in the sides a little. They usually have too much fabric for the fluff anyway. Thanks for the chance to win. I don't have very good nails so I don't wear nail polish. I think I'm gonna get a beautiful pink and give it a try. Thank you! I favorite shade is pale blue. My favourite colour nail polish is called 'Chiffon Haze'. It is a pearlescent pink and each time I look down at my toes I can't help but think how pretty they are. My mini quilt will be pink with a streak of silver. My favorite nail color is pink blush, but I'll put something really bright into my nail polish quilt. I love your version of the quilt, so bright and pretty. My favourite shade of nail polish is a neutral pink/beige for my fingers and then anything goes for my toes! Beautiful quilting. Pearl is my color of choice. Thanks for the giveaway. Cute! I usually only use nail polish on my toes and like darker shades of red. I recently tried a limey green, but they ended up looking as though they had some sort of fungus issue! Very unattractive. That bottle of nail polish is now relegated to craft use only! Our mini is so cute and I love the idea to turn it into a pillow. I paint my toes a lot during the summer, since sitting at the market spinning encourages a lot of people to stare at them, but i don't think I have a favorite color for them. So far I've this year I've used sparkly purple, blue, silver, and now I'm on a deep purple. So many colors, so few weeks to wear them! Love doing my toes in a shade of aqua. I have just discovered Crabtree and Evelyn's "Peaches and Cream" and I love it. It is a wonderful summer color and it will make a beautiful mini wall hanging with the soft pink bottle and black cap. Thanks for this opportunity, I love shopping at the "Fat Quarter Shop"! Since I have short, always cracking and breaking nails, I use the clear polish, so I don't call attention to them, which is totally opposite of my personality and color choices for quilts. There, I tend to go with bright, happy colors. Thanks for the giveaway opportunity. 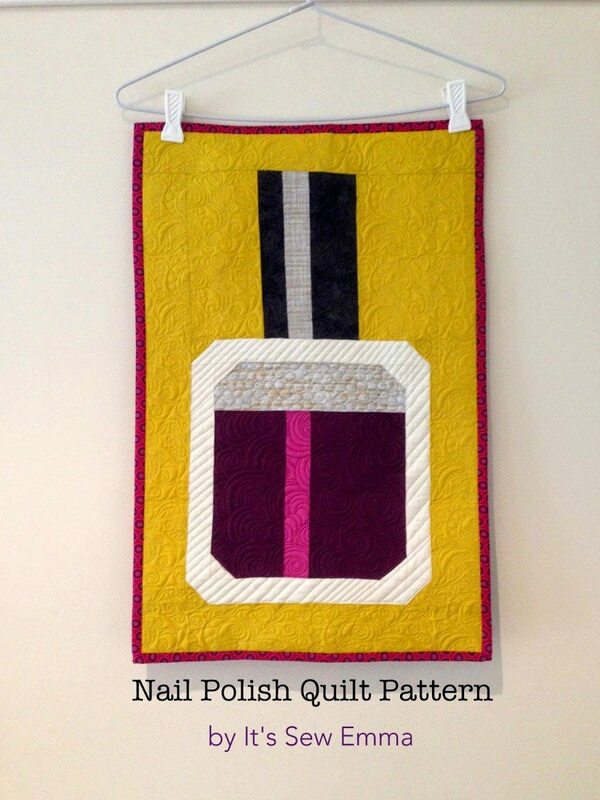 I don't use nail polish but love your nail polish quilt. I've always admired nail art though, on other people. My favorite shade of nail polish is mauve, which my 17 year old has informed me is sooooo 80's! As my hands are ageing I'm using softer colours, I like a pink with a pearl finish….but something brighter for the toes! Cute wall hanging……your ideas are endless! I think my favorite shade of polish is OPI's "I'm not a waitress". I keep going back to it time and time again! This is the cutest little quilt! I love neutrals (pale pink, white, and a medium brown are go-tos), but def have seasonal favourites. Coral and mint/teal have been main choices this summer! My favorite shade is lavender glitter or metallic. Plum. I love shades of purple for pretty much everything, nail polish included. My favorite color of nail polish is a deep turquoise…..some day I will wear that color while frolicking in the ocean of Hawaii. Thank you for the chance to win. That is so cute—I have a 12 year old who would love it!!! She is such a diva!!! Thanks for the opportunity!!! Thank you for the giveaway! I love aqua! I currently like coral, but my all-time favorite is OPI's All Rose Lead to Rome! Honestly, this is the first time a mini quilt has made any sense to me. OMG I LOVE IT. I need to make it and turn it into a cushion. I once lined up all of my blue nail polishes and found that I have over 5 feet of bottles of blue nail polish. So I think my answer must be clear: blue. Specifically, it's Bermuda Breakaway, a China Glaze blue nail polish from, like, 2008 that I have carefully carefully rationed. Purple!! 🙂 great mini quilt! thanks for the chance! The moment I put on nail Polish I suddenly break all my nails. On the rare ocassion I do wear it, it is a boring light reddish brown. I would like to wear a nice bright turquoise blue! My favorite nail color right now is Need a Vacation by Essie. Lovely, summery pink!